Last season FAU embarked on a 0-4 mark to close out conference play. With three games remaining and two of them on the road, that could seemingly topple unless things turn around quickly. 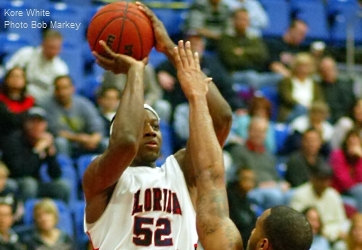 Tonight, Florida Atlantic (18-9, 10-3) dropped their second straight contest falling 72-64 to Louisiana at FAU Arena. For the third straight time they let the opponent shoot at will from long range, and for the second straight time dropped a paltry 14.3% there themselves. Making matters worse was a 36-18 manhandling on the glass. This comes on the heels of a 29-21 showing against Denver - the leagues worst rebounding team. Kore White (pictured above) scored eight of the Owls first 10 points in what was the lone offensive highlight of the evening. The Ragin’ Cajuns led most of the first half until Brett Royster’s jumper tied it up at 17 a piece. Florida Atlantic shot 0-of-7 from beyond the arc in the frame, which helped enable a 31-27 advantage at the break for UL, despite 13 Ragin’ Cajun turnovers. Ray Taylor finally sank the Owls’ first three point basket at the 14:55 mark of the second, sparking what had been a relatively momentum free attack. Shortly afterwards, Alex Tucker fed Jordan McCoy underneath in which he converted an ensuing free throw upon to put FAU back on top at 43-42. However, the Ragin’ Cajuns answered with a hot hand, sinking 8-of-11 from the floor, and eight straight at the line, to build a double digit lead with less than five minutes remaining. “In the second half we took the lead, and then we made some ridiculously stupid plays”, Jarvis said. Two free throws by Tucker completed a 6-0 Owl run that had the home team within striking distance at 68-63 with just 1:48 to go. 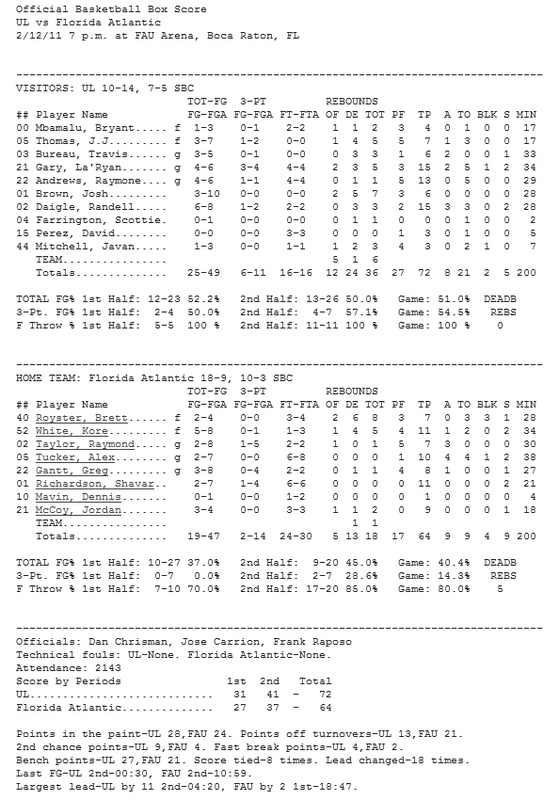 But Louisiana (10-14, 7-5) managed the game clock to perfection thereafter, absorbing 1:02 on the two possessions in which they scored the difference, while Dennis Mavin added a free throw for FAU. Three players were in double figures for the Ragin’ Cajuns, who have now won seven in a row. FAU completed 24-of-30 attempts at the line in the foul laden affair which heard the whistle blown 44 times. The Owls will have a week off before facing southern rival Florida International next Saturday at 7:00 p.m. in Miami.